Industry-grade hardware built for your custom processes and data-capture needs. Hardware can be one of the biggest barriers to implementing an effective business process management system at any company. Hardware is often cost-prohibitive, difficult to use, or faulty. Some business process management software doesn’t come with hardware, so you’re left to find those solutions on your own. DECIDE4ACTION offers hardware solutions that complement and enhance each of our leading software products. We’re proud to provide full installation and support services for all of our hardware. With our hardware, you’ll never have to distort the quality of your process to fit available hardware. 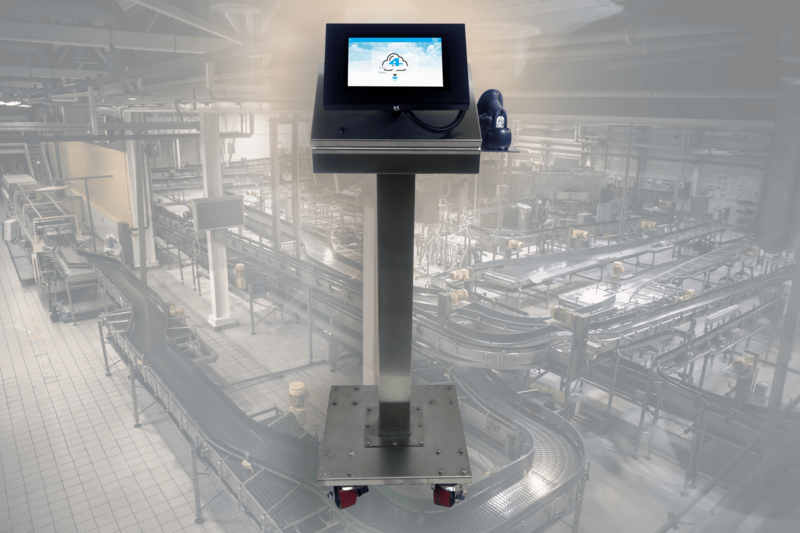 Our SMART STATION is a piece of industry-grade hardware that is placed on the shop floor to simultaneously gather data and alert employees when errors occur. CONNECT by DECIDE4ACTION is an easily deployable solutions that allows you to quickly purchase and install for immediate results. Each device provides an interface between your existing equipment and our comprehensive monitoring software. With CONNECT, any non-digital equipment can easily and quickly become part of the supervised pool of equipment. 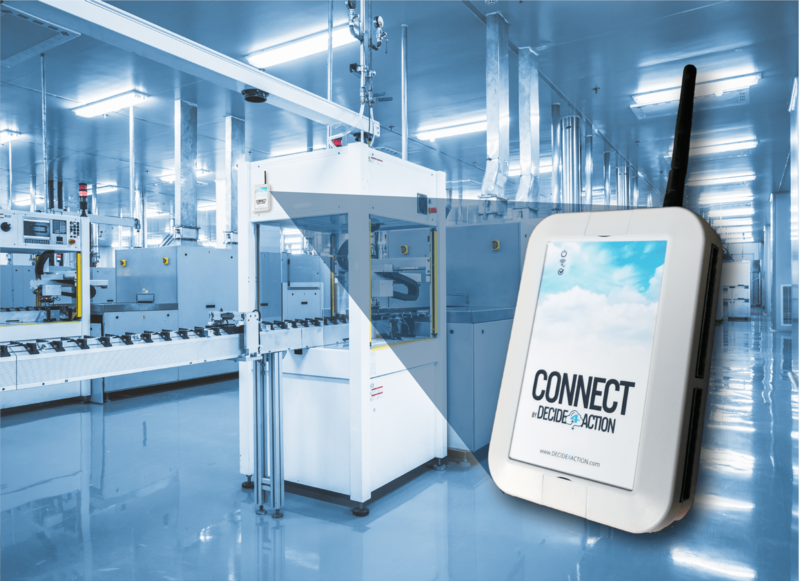 CONNECT is a rugged factory floor PLC- or PC-based device featuring HDMI, ethernet connection, wireless connection, IoT LoRa alliance network, 4 digital output, 4 digital input and 2 analog input. Meet BOB, your personal maintenance assistant. Snap it to your machines in your factory and BOB will carefully learn and analyze the vibrations and warn you before a problem impacts the production line. Thanks to the latest developments in artificial intelligence, your maintenance team now has a new friend to help them keep your production line in good health and the business running smoothly. Flat panel displays are an effective feedback tool, providing up-to-the-minute information as well as a vehicle to showcase your technology. 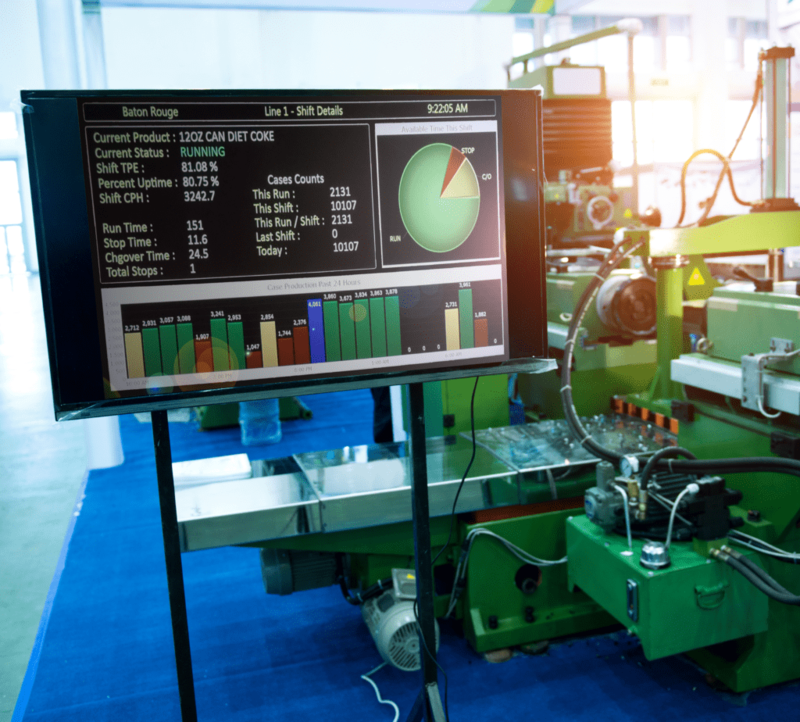 Our LCD flat panel screens display performance feedback measures including cases per hour, current efficiency, lost time analysis, weekly trends, and more. Screens are displayed in both graphical and digital formats for approximately 10-20 seconds before cycling through the next form. These displays allow for quick and informative evaluations for the entire plant. Devices like tablets, smartphones, and laptops are one of the most cost-effective ways to interact with important data. If you don’t already have them on premises, DECIDE4ACTION can provide mobile devices of your choosing so that you can monitor critical production data and have instant access to SOPs, manuals, and training videos in the palm of your hand. 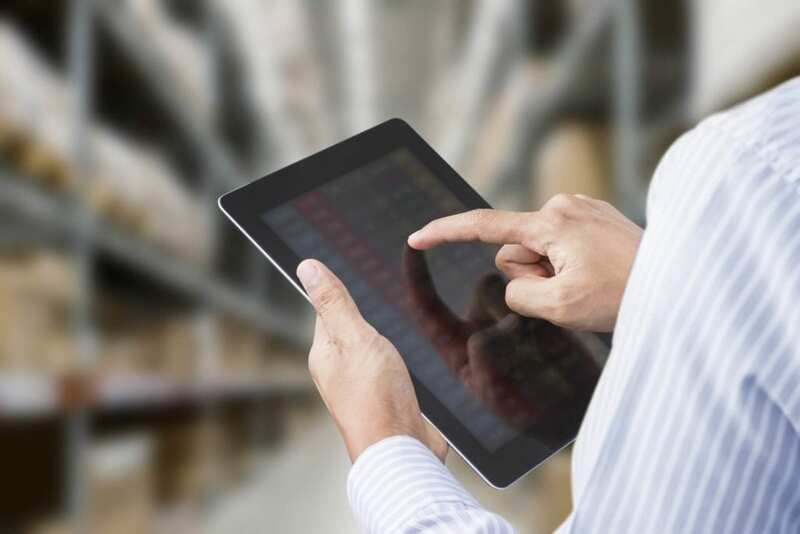 DECIDE4ACTION provides the cost-effective way to verify and track critical operational data such as receiving, inventory, batch/blend materials, packaging, shipping and much more. Preloaded with our software, these devices feature user-friendly interfaces, easy-to-learn functionality, and long-range capabilities for mobile operations. 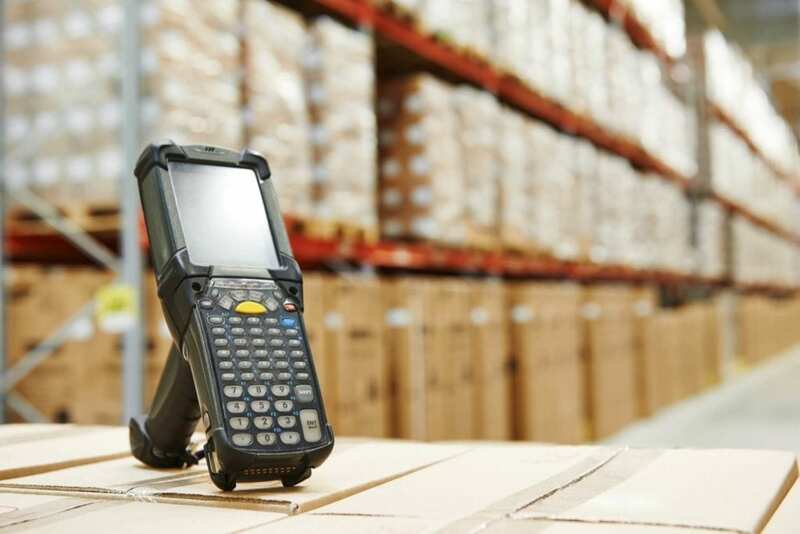 Built with a rugged construction, our scanners are durable enough to withstand the toughest of factory-floor environments. Already have intelligent scanners? DECIDE4ACTION can also be loaded into your scanner’s embedded OS (Android, Windows, brand proprietary, etc.) allowing your own equipment to be seamlessly integrated with the DECIDE4ACTION platform. Are You Ready to DECIDE4ACTION?